Day three brings the last, but certainly not the least of our new collections! BoBunny proudly presents Somewhere In Time. With a steam punk feel you will enjoy the collection as it takes you away "Somewhere In Time". ****BREAKING NEWS****BoBunny has broken into 39,000 "LIKES"! If you would like to win the Somewhere In Time collection, we must reach 40,000 Facebook "LIKES". We know we can't do it without your help! 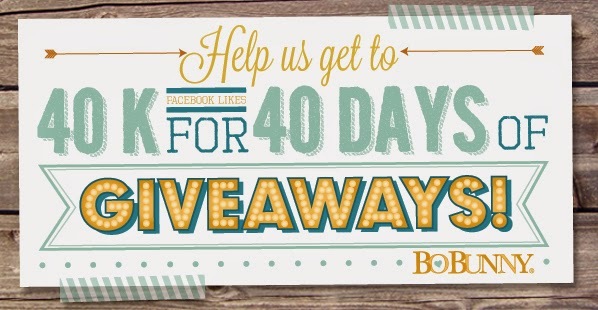 We are going to say "Thank You" for your help by bringing you 40 days of giveaways once we hit 40,000 Facebook "LIKES"! Stay tuned for tomorrows reveal of MORE NEW BoBunny fabulousness! How am I going to explain to my husband that I would also like this collection? ha ha Carin.. I have to figure out how I will smuggle mine in the house!! It's gorgeous so far I cannot wait. Another line to hold my breath for! Well done Bo Bunny! I have fallen head over heals over this line just as I did Prairie Chic this time last year! Yes, I've seen it and trying very hard to patiently wait for it to arrive at my favorite online store! The wait is the hard part! LOVE this set of paper. Was lucky enough to be at the Scrapbook EH? event in Calgary last weekend. Thank You ladies for the gorgeous layout done with this paper. It is on my must have list! OH my another must have! Oh this looks to be another awesome line! The anticipation is building! Can't wait!